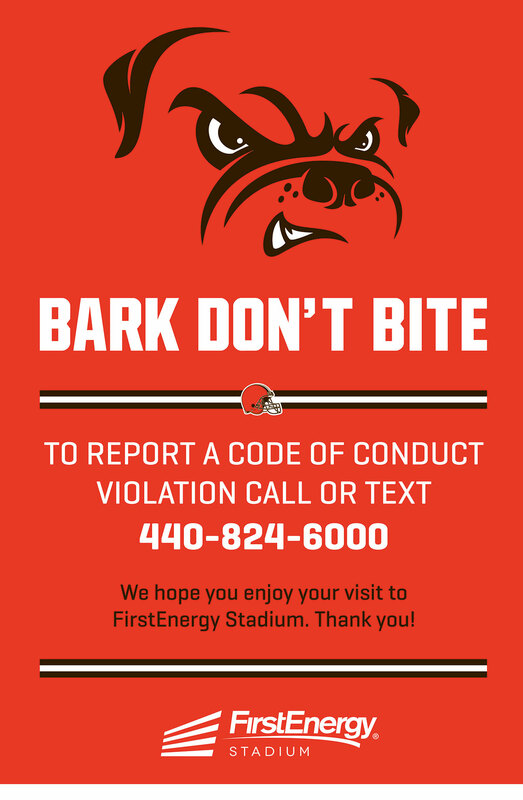 Fans entering FirstEnergy Stadium will be subject to a walkthrough metal detector screening and bag check. Click here for more information on the metal detector screening. Visit www.NFL.com/allclear for more information on permissible bags. Click here for a list of prohibited items. Click here for our event day hotline information. Click here for a guide to accessing your seat on gameday. Located in 400 East End Zone, the Bud Light Balcony and Ford Zone provide great views of the stadium and a variety of food and beverage options. They are accessible via the stairs at Section 118 or 122, or the elevator at Section 122. Elevators are reserved for Suite Ticket Holders, guests with disabilities and properly credentialed staff. Club Escalators are reserved for Club Seat and Suite Ticket Holders. Designated smoking sections are available outside any of the North Gates on the 100 Level, including: CREE Gate by Section 124, NE Jr. Gate by Section 130, NW Jr. Gate by Section 137 & NW Gate by Section 144. For more information on the concessions offered at FirstEnergy Stadium, visit www.cbhospitality.com.